g provider of advanced Linen Management, Laundry and Uniform Systems that integrate the latest RFID technology to increase profitability for hotels, resorts, casino operators, sports arenas, convention centers and theme parks. 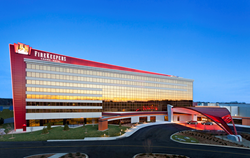 The InvoTech System installed at FireKeepers Casino Hotel manages the Uniform inventory for 1,750 employees. FireKeepers joined MGM Entertainment, Caesars, and Harrah’s as a part of InvoTech’s extensive client portfolio of Casinos worldwide. Click here for more information on InvoTech’s Linen, Laundry and Uniform Systems. “The InvoTech Uniform System manages all aspects of uniform operations. It monitors employee use and typically delivers an average of 25% savings in labor costs and a 5% reduction in on-going purchases,” said Oswald Lares, Director of Sales & Marketing at InvoTech Systems, Inc.
FireKeepers Casino Hotel, owned and operated by the Nottawaseppi Huron Band of the Potawatomi, is located in Battle Creek, MI and has been named Best Casino by audiences in Western Michigan and Northern Indiana, plus earned 9 first place awards in the Casino Player Magazine Best of Gaming Native Midwest category, including Best Overall Gaming Resort. FireKeepers was also selected one of the Best Casinos to Work For by Casino Player Magazine. Our signature restaurant, Nibi, is a multiple recipient of the Wine Spectator Award of Excellence. The property features 2,900 slot machines, 70 table games, a live poker room and bingo room. FireKeepers offers a AAA-rated Four Diamond resort-style hotel with 243 rooms, a functional multi-purpose event center, six distinctive dining destinations, and multiple lounges. FireKeepers is the title sponsor of the FireKeepers Casino 400, a Monster Energy NASCAR Cup Series race at Michigan International Speedway, and host of the FireKeepers Casino Hotel Championship a Symetra Tour-Road to the LPGA golf event.